Bestowed (red), Forgotten (Green), Fly on little wing (winter ascent – yellow), Bedazzled (light blue), Flywheel (orange), Petit Peuterey D (dark blue). There are many additional routes and we do not have a lot of information on several of the indicated routes. From Dasler Bivouac scramble up through tussock and scree to a saddle at the base of the ridge. The ridge is excellent quality rock and leads directly to the summit and perhaps the finest viewpoint in the valley. Running shoe ascents of this route have been made in summer. Begin between two snow patches (approx. 200m north of Bedazzled) at base of cliff left side, climb slightly right, onto a large triangle buttress (good rest spot) on the face, into a corner chute and up to reach the ridge between two spikes. 210m. Grade 12 up to buttress, 14 above buttress. Begin about 50 metres to the left of Bedazzled and follow a fairly straight line of slabs directly to the North Ridge, always left of Fly on Little Wing, Finish about 100 metres north of the summit. About grade 12 with limited protection. Andrew Rennie and Tom Lanagan climbed a mixed winter route on the west face of Dasler Pinnacles. WI4 for the start, a really tough last two pitches and overall grade 5ish. Winter 2007. Start up the the obvious ice hose left of the summer line “Bedazzled“, then angle right up an easier snow slope to reach the big arete at about three quarters of the way up the face. Three pitches of hard mixed climbing up the arete to the summit. The first accent party took 17.5 hours to complete the climb from Daslers Bivouac. A second line on the north west face of the Dasler Pinnacles. This recently named route was climbed as early as 1970. A 400m line on the buttress to the left of the big dark corner on the Pinnacles. The route climbs rock at grade 14-15 and ends directly on the summit. This route on the north west faces climbs the tall slab face to the right of the huge black corner on the Pinnacles. At first climb 200 m up centre of face to a terrace, move left to within 50 m of the black corner, then 400 m of slabs keeping roughly parallel with the corner. The slabs give consistent grade 12-14 climbing. 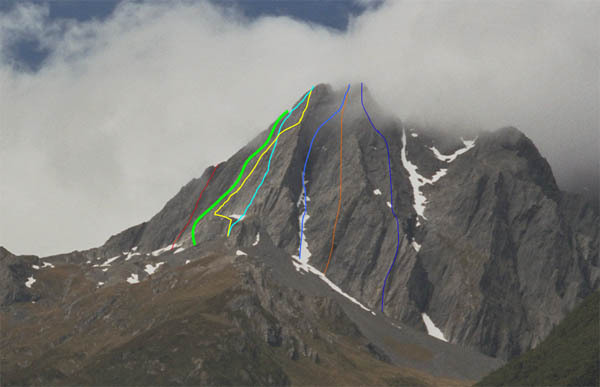 The route is to the right of Petit Peuterey and ascends the striking line on the southern (lower right) tier of the face, with sparse but adequate protection (all rock gear). The first ascentionists found thin ice and much of the rock rotten or blank, hence the lack of protection. The best descent is to abseil the route.